Yesterday morning in synagogues throughout the world the Jewish people read the portion of the Torah called Yitro. Named for the Medianite priest who became father-in-law to Moses, Yitro (or Jethro) was also a trusted adviser to the Israelite leader. While it doesn't mention this in the Torah, it is possible that Yitro had black skin which likely meant that Moses was married to a Black woman thereby making them the first bi-racial marriage in the Torah. Today, the most famous rapper with bi-racial Jewish-Black heritage is Drake, who has a White Jewish mother and a Black father. Last night Drake hosted the year's first Saturday Night Live show and Jewish and Black stereotypes were getting tossed a mile a minute during his opening monologue. The famous rapper opened the show by explaining that he's from Canada, was in the TV show Degrassi Junior High, and that his mother is Jewish and his father is Black. He then had a flashback to his bar mitzvah in 1999 when both sides of his family met for the very first time. Wearing a big white kippah (yarmulke), Drizzy gave his bar mitzvah speech in which he sang a rap to the tune of Hava Nagila. Yes there were quite a few stereotypes about both Jews and African Americans, like when his Jewish uncle gave him a check for $18 (chai) and his Black uncle gave him a check for a $1,000 but told him to wait 90 days to cash it, but these were all in jest and it's Saturday Night Live after all. This was also the first appearance of SNL's newest cast member Sasheer Zamata, who was hired after Lorne Michaels, the show's creator and producer, took a lot of flak for the lack of African American women on the show. 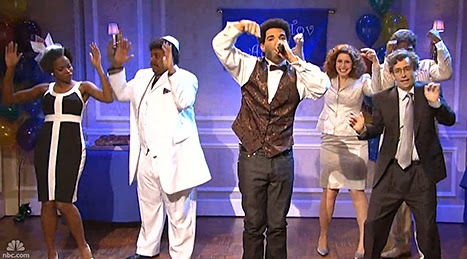 I'm not sure if Drake's appearance on SNL had a positive effect on Black-Jewish relations, but it was certainly a funny skit that shouldn't offend anyone. Plus, it was great seeing Drake speak so openly about his Jewish upbringing and bar mitzvah in a way that even my kids can watch. As I wrote about on this blog, Drake's "HYFR" music video shows Drake wearing a tallit and drinking Manischewitz, as well as saying L'chayim as a young boy at a friend's bar mitzvah. The "HYFR" video is too explicit for my children to watch (and too explicit for this blog), but it is available on YouTube by searching for "Drake" and "Bar Mitzvah". Thanks for this! I had no idea Drake was Jewish!! Makes me wonder what his bar mitzvah would've been like. Did he give a traditional speech like any of these or did he follow his talents and give a performance? You should take a closer listen to Drakes prayer. He is asking for The Kim Kardashian and Kanye West to be blessed and magnified? Are you aware that there is a new religion called Yezzianity? I would not glorify or promote anything further that Drake is involved in. Who else wants Drake to do a modern musical version of selections of Psalms? He has soul. He can do it.